At Campingplatz Horn in Gaienhofen (Baden-Württemberg) camping costs as little as €20,- per night during low season with CampingCard ACSI. At one of the 175 touring pitches you will get a discounted rate during the period 12-04-2019 - 26-05-2019, 23-06-2019 - 30-06-2019 and 01-09-2019 - 03-10-2019. At this campsite you can not only use your CampingCard ACSI for inexpensive camping, you can also use your ACSI Club ID (as an alternative ID). 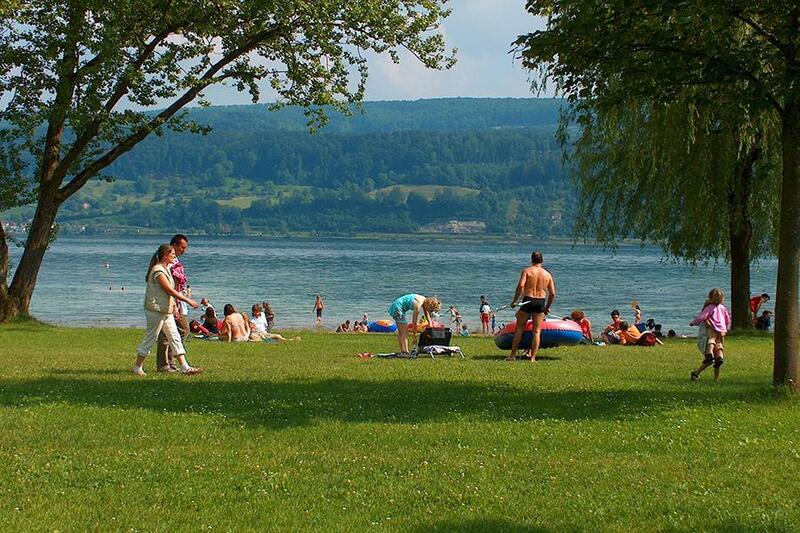 A very pleasant, lively campsite on Lake Constance with spacious pitches. Cars may not be parked on the site. There is a restaurant by the lake. Many facilities are powered by solar energy. Lovely site close to Lake Bodensee. Pitches are a good size, arranged in circular area with cars parked elsewhere. Some pitches are very shady and potentially damp under foot, others in full sun. Water taps on each pitch. Showers cost 1 euro but this is refunded to ACSI customers on leaving. Best value washing machines I have found to date! Small shop with basic food stuffs but larger supermarket in village. No restaurant on site in September but one on the adjacent beach with lovely views over the lake. Good potential for cycling. Very helpful staff when we arrived late at a busy weekend and the site was full - found us (and others) a quiet pitch in overflow area. Modern, clean facilities despite being busy. A variety of bread available at nearby bar/restaurant by lake every morning. Friendly ambiance. Good bike paths. Free tourist transport on buses and trains - easy to visit Konstanz. Beautiful area. an excellent site, situated right by the side of Bodensee, with good swimming in the lake, in June the temperature was Good! good walking and cycling routes right outside the camp, a nice walk down to the village or the opposite direction down to the Horn. the pitches are set within circles aka waggon train if you can remember that far Back! but a great idea, I think it works well. would be a good site for any children, wish we could have stayed longer than two nights. Staying on this site for a few days in a whistle-stop tour of The Black Forest. The various zones are round with twelve pitches all facing inwards which gives a nice sense of community. Dogs are only allowed in certain zones. The facilities are spotless, the showers spacious (shower is refunded on leaving if staying with ACSI). The restaurant is very nice with a large outside seating area. The food is wonderful and not over priced. I am vegetarian and the veggie options are excellent. The site is 100 yards from the lake where there is another restaurant and bar. Swimming is popular in the lake which is only a few feet deep for some distance. Seems an excellent site for children. We last stayed at this site in 1987 and thoroughly enjoyed ourselves so decided to return this year. The booking process was very easy and on arrival the staff were very helpful and pleasant, the site is very clean and has a slightly unusual layout as far as each area is set out in a circle with all caravans facing inwards, also cars are kept outside in the car park, with its proximity to Lake Constance and everything that has to offer a truly lovely location, the site also gives you transport passes so you can travel free of charge on the local busses etc. There are too many places of interest to mention, but a visit to Rhinesfall is a must a very impressive waterfall in Switzerland, just a short drive away. We will certainly be returning to stay here again and perhaps not leave it another 29 years this time. Would you like to book Campingplatz Horn or request more information? You can do both using the information below. From Radolfzell direction Stein am Rhein-Moos-Gaienhofen-Horn. Then follow signs. CampingCard ACSI will send your information request to "Campingplatz Horn".